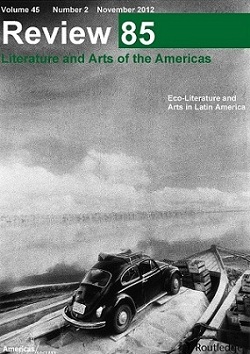 The eco-literature and arts issue of Review was guest-edited by Steven F. White (St. Lawrence University). Contributing authors include Homero Aridjis, from Mexico; Astrid Cabral, from Brazil; Esthela Calderón, from Nicaragua; Leonel Lienlaf, from Chile; and Juan Carlos Galeano, from Colombia/United States. Learn more or purchase Review 85. Subscribe to the magazine.